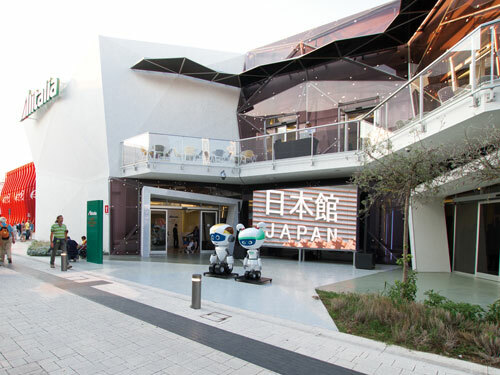 Located in the heart of the Expo Milano precinct, the Alitalia-Etihad Airways multimedia pavilion served as a social hub for visitors, spreading a wealth of multimedia entertainment across two floors. Installed in a variety of multiple and single configurations was a total of 99 Panasonic professional video wall panels and interactive touch-screen displays. The displays were used to tell real stories and travel adventures, allowing patrons to feel the meaning of the pavilion’s ‘Connecting the World’ theme. These comprised 86 Utra-Narrow-Bezel TH-55LFV70 video-wall panels (boasting a bezel-to-bezel distance of just 3.5 mm and powerful features to simplify installation and enhance picture quality); seven Multi-touch Screen TH-50LFB70 interactive displays; and six 80-inch TH-80LF50 LCD displays with high 700 cd/m2 brightness and extra-tough build quality to handle continuous 24/7 use. All media was displayed flawlessly, helping visitors to visualise a voyage through the cuisines and cultures of the world.